My final extended shoot was in mid-October to a pair of national parks — Sequoia and Kings Canyon, which to all intents and purposes form a single preserve. 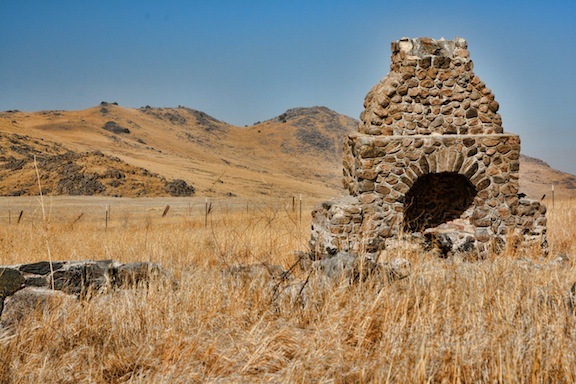 They lie between Yosemite to the northwest and Death Valley to the east. 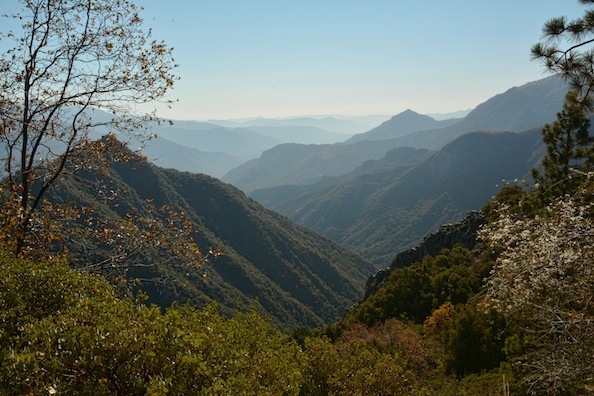 Sequoia sits atop Kings Canyon; together they are roughly an hour drive from Fresno. As she did on all but one of the others (see earlier posts below), my wife, Pat, accompanied me, as, as is her willingly accepted role, served as shotgun-seat navigator and, while I am away from the car shooting whatever, avid book reader. Over the years she has read probably the equivalent of War and Peace several times over. To say she is a model of patience is an understatement. 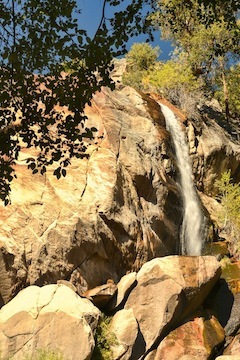 The trip, which spanned four full days, included three nights at the one and only hostel on protected public land, Wuksachi Lodge, tucked away off SR 198 inside Sequoia park. Because it is the only game in town, it offers neither bargain rates nor luxury accommodations. Even blindfolded, guests are unlikely to imagine being magically transported to, say, a Ritz-Carlton. That said, the room, albeit smallish and a tad Spartan, was OK, the chow was good but pricey, and the location cannot be faulted. It affords myriad short trips – hiking, biking, shooting – in all directions. The drive to the lodge from our home in Lafayette, some 18 miles east of San Francisco as the crow flies, took almost six hours, considerably longer than we had expected. But then, we stopped to eat, refuel, and, of course, take time out for a couple of savory photos ops, both bound east from Fresno. The first was what was left of a dwelling presumably consumed by fire. Besides the massive fireplace, all that remained were vestiges of masonry steps. I liked the contrast of the in-your-face stonework against the hills and the azure afternoon sky. There was no signage to offer any clues either when it was built or when it was rendered to its present lamentable state. In any case, it stood out from the highway like the proverbial sore thumb. 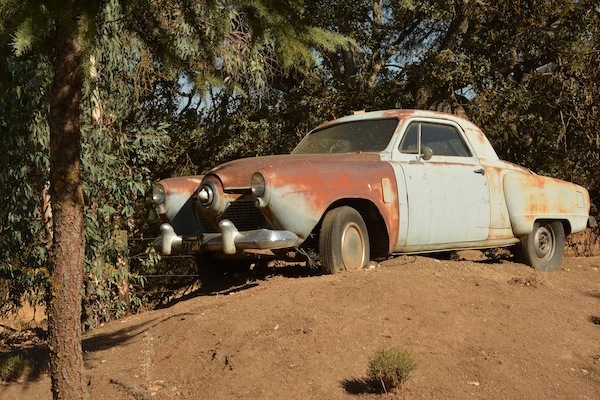 Likewise beckoning me forth, a few miles down the road, was a prominently placed old Studebaker, perched on a mound behind a padlocked chain-link fence. Upon the gate hung a homemade sign reading “Squaw Valley Herb Gardens. Closed Sundays.” Rats, I told myself, as the choice Rusted Relic “spoke to me,” as they say. But then so do many old cars and trucks. Peering over the gate, I espied other Studebakers in the distance. As I hopped back into the car, I told Pat that I wanted to revisit the place the following Thursday, on our way back home. Looking up from behind the New York Times, she nodded her head up and down, which I read as a gesture of affirmation, as nothing was spoken. One huge benefit of visiting the parks when we did, in mid-October, was that, with school back in session, crowds had thinned. We also were blessed with glorious weather – highs in the mid-80s and blue skies. I should add, “mostly cloudless” blue skies, and few if any landscape photographers pray for no clouds, as their daytime absence generally translates to visual boredom. 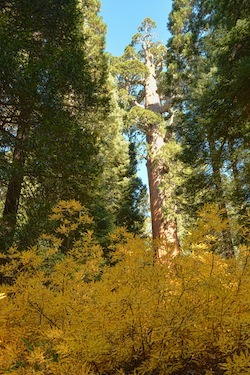 One day we drove a half-hour or so south to behold, as do virtually all ambulatory park visitors, the grandiose General Sherman tree pictured (below left). 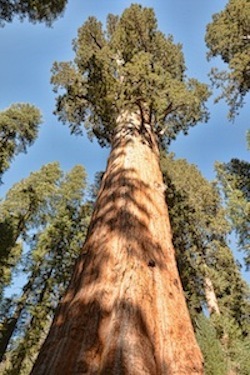 It is reputed to be the “largest living thing on earth.” It stands 275 feet tall, has a girth of 79 feet and is guesstimated to be 2000 to 3000 years old. Two other must-see trees in the park are the General Grant (above right) and the President, 267.5 and 247 feet, respectively. The former was dubbed the “nation’s Christmas tree” by Calvin Coolidge in 1926; the president alluded to in the latter is Warren Harding. Having ogled the Grant tree, we ventured into the bowels of Kings Canyon, to the end of the road, some 50 miles past the visitors center. It terminates mid-way through; there is no egress or ingress to the park from the eastern side. Toward the end of the Road To Nowhere I jumped out of the car long enough to take a photo of a waterfall that, to my pleasant surprise, actually had falling water. It tumbled from its source high in the mountains into the Kings River below, which, given the time of year, was down to a trickle. The day following we saddled up at the lodge and wended our way south on Hwy. 198 to the seen-better-days hamlet of Three Rivers (pop. 2,182), which bills itself as the “gateway to the Sequoias.” More accurately, it is the southern portal, not the only one. (Score one for the Three Rivers Chamber of Commerce, if there is one, and there probably is not.) After refueling at the indisputably only gas station, we retraced our way back, but not before a tourist-obligatory stop at locally famous Reimer’s Candies, Ice Cream & Gifts shop. In addition to yummy homemade ice cream, it offers “more than 80 sinfully delicious and rich” varieties of homemade chocolates. We did our best to restrain ourselves, drawing the line (or belt) at single-scoop cones and four truffles. The cones were scarfed within nanoseconds, the chocolates were wending their way through the alimentary canal by day’s end. Although the distance between our lodge and the village is only 20 miles, it mostly switchback roads and, of course, the seemingly unavoidable motor homes, which, in my opinion, should be the next target of the Tea Party. Fortunately, there are turnouts, and, equally fortunately, there exist motorhome drivers who are courteous enough to use them. As we tiptoed past one, we waved a thank-you to the driver while throwing pope-blessed holy water on it. There are indeed nice people. We ourselves made use of a turnout up the windy road, enabling me to take this picture of a misty vista overlooking the Kaweah River. I did so as quickly as I could, as I did not want to find ourselves stuck behind the self-same motorhome, especially because we were out of holy water. After taking a lovely, leisurely walk the following morning along a trail behind the lodge, we packed up, checked out and headed home. In all, a most enjoyable, relaxing (sloth-like motorhome incident notwithstanding) mini-vacation. Shazam! Not only did was I not invited to scram, I was being invited to a personally guided tour by the collector himself. “Tom,” I replied, handing himself a business card. Tim escorted me through the grounds, five acres in all, stopping along the way to comment on this, that and the other vehicle artifact, which besides the cache of Studebakers, included a 1956 Mercury, a 1926 Ford and the disembodies front fender from a 1949 MG.
Additionally, there were a handful of old signs strewn about. Tim paused to explain why there were so many old signs. 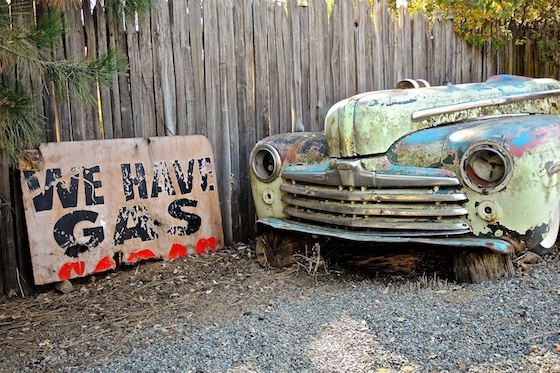 “I am a sign maker by trade, so there is a natural affinity for collectible signs. What you see here is from a store in Fresno that was going out of business. The owner said it was mine free and clear, provided that I paid for its removal and hauling. It cost me $200 to have it taken down and lovingly place in the bed of my truck. They say there is no free lunch, but this came close,” he added, smiling broadly. I asked, hopefully, if it might be for sale. Nope. As I was clicking away from different angles, meanwhile trying to avoid shooting directly into the sun, Tim recited the car’s history. Photo-editing completed a few days hence, I sent my host a link to the gallery, reiterating that he was welcome to any images he wanted, just identify them by frame number. Moral of tale: People are funny. Like life itself, photography is a crapshoot. One never knows what to expect, how things play out. Interaction with fellow humanoids is ever unpredictable. It’s one thing that makes the “stumble-upon” nature of the adventures even more interesting. Posted In: Abstract, Blog, Galleries, Landscape, Relics, Travel, Uncategorized.